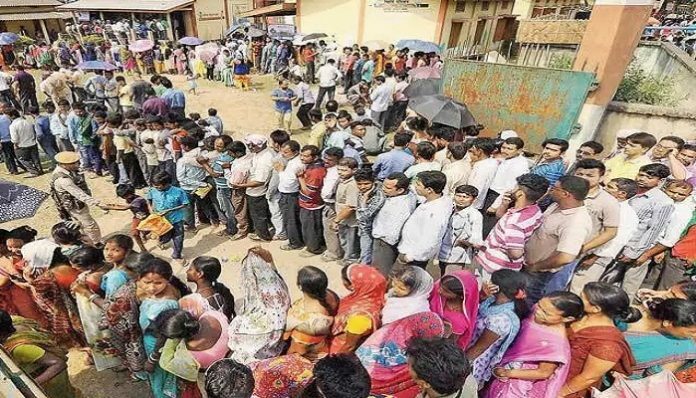 Amaravathi: Andhra Pradesh recorded nearly 80 per cent in polling in Assembly and Lok Sabha elections for which were held Thursday, said the election commission.While the percentage for 175 assembly seats stood at 79.64, that of 25 Lok Sabha constituencies registered 79.74 per cent, according to the final figures released by the election commission here Saturday.This indicated a marginal increase of 1.23 per cent over the polling percentage of 78.14 recorded in 13 districts of the then united Andhra Pradesh, the election commission said.Of the total 3,93,45,717 voters in the state, 3,13,33,163 cast their votes for the 319 Lok Sabha candidates and 3,13,33,631 for the 2,118 assembly contestants.For Lok Sabha, 1,55,46,213 men exercised their franchise but the number fell to 1,55,45,211 when it came to the Assembly.In the case of women, 1,57,87,759 cast votes for the assembly and 1,57,86,285 for the Lok Sabha.The vote count of transgenders was 665 for Lok Sabha and 661 for Assembly.The overall difference of votes polled for Lok Sabha and Assembly, thus, was 468.Like in 2014, Prakasam district retained its top position with the highest polling percentage of 85.93 (83.55 in 2014), marking a 2.38 per cent increase.Guntur came second with 82.37 per cent, with a 0.49 per cent increase over 2014.West Godavari recorded a 0.60 per cent less polling this time at 82.19, thereby dropping to the third place compared to the previous election.East Godavari registered a 1.09 per cent rise in voting at 80.08.The voting pattern in the two Godavari districts could determine the overall election outcome.In the four Rayalaseema districts, Kadapa recorded a meager 0.37 per cent rise in voting while Kurnool topped the state with a 3.65 per cent rise.Both are considered the stronghold of YSR Congress.Anantapuramu, the TDPs citadel, saw a 2.19 per cent increase in polling while the Chief Ministers native Chittoor district polled 2.30 per cent more votes than in 2014.Krishna district, where the ruling partys hopes largely lie, a 0.97 per cent increase in polling percentage was witnessed.In north coastal Andhra, there was a negligible 0. 15 per cent increase in Srikakulam district and 1.09 per cent in Vizianagaram. Visakhapatnam recorded a 0.16 per cent drop in voting compared to 2014.SPS Nellore, one of the strongholds of the principal opposition party, also saw a 1.84 per cent hike in poll percentage.Among the Lok Sabha constituencies, Narsaraopet recorded the highest 85.53 per cent polling.Here, BJP state president Kanna Lakshminarayana took on veteran parliamentarian Rayapati Sambasiva Rao of the TDP.Bapatla (SC) and Ongole recorded 85.49 and 85.23 per cent respectively.Araku (ST) registered the lowest 73.67 percentage followed by Srikakulam (74.08 per cent).